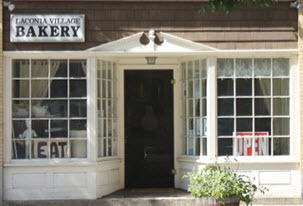 Bakery shops in the Lake Winnipesaukee area are pretty spread out. You can find some delicious home made treats, breads and the best birthday cakes ever. Some of these places have breakfast items such as bagels and danish. Others have great desserts or little treats for that afternoon snack. When you walk into these local bakeries, the smell of the fresh, baking bread just makes your mouth water. You can buy things right off the shelves or order ahead of time for that special occasion. I'm sure there are many other places that aren't listed. If you know of bakery shops that should be added to this list, then use the contact form to let us know about it. Kara's Cafe is located in the heart of downtown Meredith. You can enjoy fabulous pastries, treats and sandwiches. 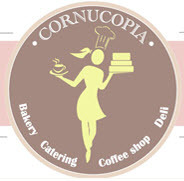 Cornucopia Bakery and Cafe uses organic and locally produced ingredients. This family business has quality, homemade food to please everyone. The Yum Yum shop has sweet smelling, fresh baked goods. You'll find breads, bagels, doughnuts, and pastries. 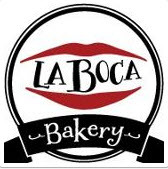 La Boca Bakery is located in the heart of downtown Wolfeboro. They offer hand crafted breads and desserts. Bay Gulls offers a pleasant and healthy bagel experience. Check out the new "Dockside to go" where your sandwiches are delivered to you at the Center Harbor town docks. You'll find some wonderful artisan breads and rolls as well as specialty treats and pies in season. 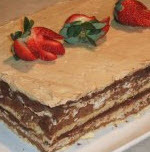 Gilford Gourmet specializes in desserts to order. This includes individual treats all the way up to dessert buffets for special events.